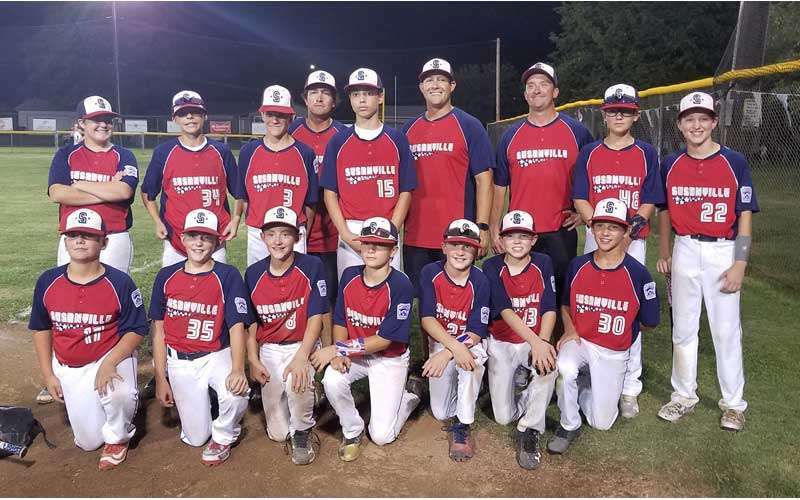 Susanville’s Major All-Stars traveled to Redding, California from Saturday, July 14 to Tuesday, July 17 to compete in the Section II All-Star Tournament. Susanville proved to be a competitive force in the tournament, but ultimately came up short. Susanville’s first game of the Section Tournament was a match up against Chico Eastside on Saturday. Chico won the coin toss and chose to be home team, which gave Susanville the opportunity to hit first. Susanville ended up falling to Chico Eastside 6-3. Offensive seemed a little hard to come by for Susanville in the first game. Susanville only came up with six hits on the night. Sutter Moss, Matt Battey, Jack Wright, Jay Mckernan, Zayn Wright and Tyler Zahniser all had one hit each. Jack Wright and Zahniser each had an RBI as well. On the mound for Susanville, Connor Wolcott got the start. Wolcott pitched two innings giving up five runs on five hits and two walks. He had two strikeouts. Seth Mallery came in behind Wolcott and pitched 1.2 innings, giving up one run on one hit, one walk. Mallery had two strikeouts. Reese Chappuis finished out the game on the mound. Chappuis pitched 1.1 innings giving up no runs, no hits and throwing one strikeout. 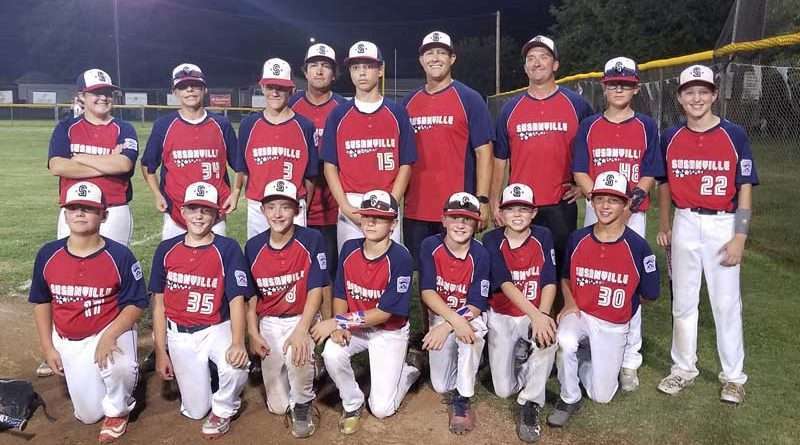 After a tough loss in the first game and ending up in the loser’s bracket, Susanville took on Peach Bowl in an elimination game on Sunday, July 15. This time, Susanville was the home team and won 2-1 in walk-off fashion. The game was tied at one run a piece in the sixth inning when Chappuis singled on a 3-2 count, thus scoring the game winning run. The pitching was strong on both sides during the game against Peach Bowl. Jack Wright started on the mound for Susanville throwing two complete innings, giving up two hits, two walks and no runs. Battey was next on the mound for 2.1 innings. He gave up one run on no hits, four walks and had two strikeouts. Following Battey was Moss. Moss pitched .2 innings giving up one hit, one walk and no runs. He threw one strikeout. Chappuis came in to pitch during the sixth inning and closed out the game for Susanville. Chappuis gave up one walk, no hits and no runs to hold Peach Bowl at one run. Susanville’s defense was sure-handed and didn’t make any errors in the game. Susanville racked up nine hits against Peach Bowl. Zahniser and Chappuis both managed multiple hits each. Zahniser went 3-for-3 at the plate leading the way for Susanville. Chappuis went 2-for-4 with one RBI. Moss went 1-for-3, Battey went 1-for-3, Wolcott went 1-for-3 and Peyton Garate went 1-for-1 to account for all of Susanville’s hits. With the win over Peach Bowl, Susanville stayed alive in the tournament and came back Monday, July 16 to face Chico again for another elimination game. This time Susanville’s bats and pitching proved to be too much for Chico to handle; Susanville wont the game with a score of 11-4. Zahniser started on the mound; he pitched .2 innings giving up one hit, two runs and two walks. Mallery took the mound in the first inning with two outs and bases loaded. Mallery finished off the last out of the inning without allowing any more runs. Mallery pitched a total of 3.1 innings giving up two runs on two hits and one walk. Moss followed Mallery on the mound and finished out the game. He pitched two shutout innings, with no hits and no walks. He pitched one strikeout. Offensively for Susanville, Mallery set the pace going 2-for-4 with four RBIs. Battey went 2-for 3-with two RBIs, Zahniser went 2-for-3 with one RBI, Chappuis went 1-for-3 with one RBI, Moss went 1-for-3 with two RBIs, Nash Osborn went 1-for-2, Garate went 1-for-1 and Blake Tow went 1-for-2. In the third inning, Battey tripled to score two runs followed by a sacrifice fly from Mallery to score Battey. In the fifth inning, Susanville scored five more runs. The big inning was driven by singles from Zahniser and Mallery, a walk by Jack Wright and a double by Chappuis. Susanville’s pitching and offense were dominant over Chico this time, and they earned a little payback with the win. Game four for Susanville took place on July 17. This time, Susanville faced the hometown team, umpires and crowd from Redding in another elimination game. Susanville again won the coin toss and opted for home team. Susanville fought hard but came up short losing 6-4 to Redding East, thus ending their tournament play. The game was tied at 2-2 with Redding East batting at the top of the fifth when Redding pulled ahead. Susanville never caught back up. Starting on the mound for Susanville was Wolcott. He pitched four strong innings giving up four runs on eight hits and two walks. Wolcott pitched three strikeouts. Chappuis finished up on the mound going two innings with three hits, two runs, no walks and no strikeouts. Although Susanville strung together 11 hits in the game, it just wasn’t enough to come out on top. Leading the way at the plate was Battey going 3-for-4, Chappuis going 2-for-4 and Zahniser going 2-for-4, followed by hits from Tucker Schall, Osborn, Moss and Zayn Wright. The loss to Redding East put the Susanville All Stars out of the tournament, but the team left with high spirits and a grand sense of accomplishment regarding the 2018 season.